Jan Van Eyck, 1395-1441, one of the Netherlands’ famous artists in art history painted the real world, as detailed, as possible. Van Eyck paid such great attention to detail there is almost too much detail for the viewer to handle upon first viewing his art. Painting art detail in the manner of van Eyck required a medium that did not dry quickly. The method creating pigment at this time was grinding minerals and colored plants into a powder and adding an egg acting as a binder creating a paste-like medium. This medium was called tempra. Jan van Eyck needed a medium that was more elastic in its drying time in order to paint smooth transitions from color to color. He found that by adding oil to these powders, he could lengthen the drying time and also create thin transparent glazes that could be applied on top of each other. Van Eyck rendered great three-dimensional depth in one of his famous paintings "Crucifixion", painted in 1420-1425. Entry into the artwork is from a high vantage point peering into the distant mountains and clouds aided by enhanced atmospheric perspective. Atmospheric art perspective works the same way the human eye sees objects at a great distance. The farther away an object is from the human eye the more an object loses its linear quality that defines the object and therefore begins to fuse into its surroundings. Jan van Eyck uses atmospheric art perspective in this way. He blends the distant mountains and its linear edges into an atmospheric haze making them appear far away. The farther away an object is the more linear edges disappear and soften. The creation of atmospheric effect gives van Eyck great continuity of space in which to place his figures resembling the real world as the eye sees it. About the middle of the fourteenth century Van Eyck painted another of his famous paintings in art history"Man in a Red Turban", 1433, during a time there was renewed interest in portraiture. He turned away from the current silhouette art style of portrait painting and rendered a three quarter view portrait that may be actually be portrait of himself. The face in "Man in a Red Turban" is softly highlighted fading into a dark background adding a powerful dramatic effect. Every detail of the face is recorded but does not overshadow the personality of the portrait. Jan van Eyck painted a different kind of art portrait in 1434. "The Arnolfini Portrait", is a painting recording the betrothal of Giovanna Cenami and Giovanni Arnolfini, a celebrated union between two families. 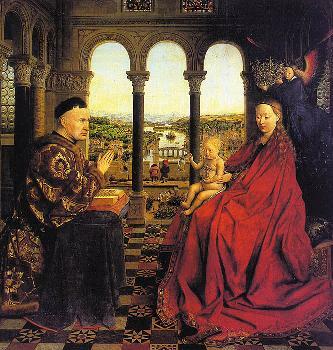 Van Eyck painted a number of interesting things in his famous paintings in art history. "The Arnolfini Portrait" has art iconography for which we don’t have may answers. The mirror on the back wall does not reflect the two main figures standing in front of us but probably the brides' father and Jan van Eyck himself witnessing a legal contact. Van Eyck lends his signature to the art in a highly visible place above the mirror possibly confirming definitely he was there. For some reason Giovanni is not wearing shoes in this portrait, and why is only one candle is lit in the chandelier, better yet why is it lit during the daytime? Other famous artists of the early Renaissance are Rogier van der Wyden and Hugo van der Goes. To view the entire gallery of Jan van Eyck, click here.